When The Weekly Dig‘s Christine Liu asked the LUPEC ladies to advise her readers on summertime drinks, we enthusiastically obliged by studying up and drinking our way through the books of Beachbum Berry and Trader Vic. Check out our story in this week’s Dig! But could it additionally be possible to get one’s tiki on in Boston? Because of the Puritanical background of Massachusetts one may assume that our fine state was never a part of Tiki Nation. Not so, my dear friends. In fact the Boston area was a hotbed of tiki torch amusements. Those of you who have been in the Boston area for a while will remember Aku Aku, the Polynesian delight that used to occupy the space that now holds Jasper White’s Summer Shack near Alewife Station. Boasting sister locations in Worcester and Newton, Aku Aku offered up Polynesian fare and stand up comedy that one could wash down with delicious tiki libations. 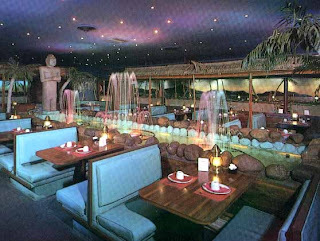 Heading back to mid-century, Boston hosted Kon-Tiki Ports in the Sheraton at the Prudential Center, Trader Vic’s in the Park Plaza Hotel, the Polynesian Village in the Somerset Hotel, Bob Lee’s Islander in Chinatown, and the Hawaiian on Boylston St.
And let us not forget the Aloha Lounge! Talking about tiki of yore can make one thirsty. Fear not! We may not be able to sit in the Kona Hut of the Polynesian Village, but there are still options for those of us longing to have our engines revved by a Jet Pilot. On Beacon St in Newton we find South Pacific. This unassuming store front in a strip mall hides a secret tiki enclave featuring bamboo, tiki fixtures and murals. Want to head someplace more accessible by T? Head on over to East Coast Grill in Inman Square and limbo on in to the Lava Lounge. This Cambridge institution is known for quality seafood and BBQ, but we heart East Coast Grill for it’s tribute to Polynesia. Order up a Pu Pu Platter, sip on your Erupting, Flaming Volcano (serves 2, limit two per couple) and enjoy the sites! Next on our field trip of all things tiki we find ourselves in Medford at Tiki Island. Although it’s not as elaborately decorated as it’s tiki predecessors, Tiki Island happily boasts “Exotic Polynesian Tropical Drinks.” Who are we to say no? On Route 1 in Saugus, we find the Kowloon. 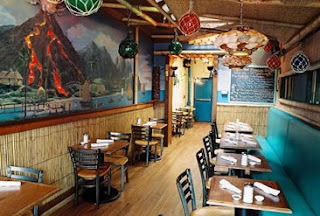 Established in 1950 by the Wong Family, the Kowloon is a New England Polynesian institution. After passing through the entrance guarded by a 15 foot tiki you have the choice of sitting in the Volcano Bay Room, the Thai Grill Room, the Luau Room, the Hong Kong Lounge or the Tiki Lagoon while you sample an eclectic menu of Szechuan, Cantonese and Thai food. Heading to the Cape for a long weekend? Don’t forget to stop by Tiki Port in Hyannis! Since 1977 the Tiki Port has been serving a blend of Cantonese, Szechuan and Mandarin cuisine along with an extensive menu of Polynesian drinks. Back from your long weekend and in need of something refreshing to erase the memories of bumper to bumper Cape traffic? Park your car, grab your friends, hop on the T and bang the gong at Pho Republique. Their Scorpion Bowl boasts mango, pineapple, passion fruit and an assortment of rums. Yum! The post-war Golden Era of Tiki may have passed, but that doesn’t mean a new generation can’t live it up Island-style. Also, when’s the last time you went to Saugus? Put a little rum in your summer by taking a pilgrimage to any of these Tiki spots. Or mix up one of these bad boys in the comfort of your own home/Island Oasis. Shake well with plenty of ice cubes and pour into a double old fashioned glass or a tiki mug. Garnish with an orchid, plus a maraschino cherry speared to lemon and orange wheels. Place a lei around your neck and enjoy. From the Aviary Bar of the Kuala Lumpur Hilton, Kuala Lumpur, Malaysia, circa 1978. Good to see others keeping the tiki alive & well in New England. You should join us on the NETT (Northeast Tiki Tour) this September.